For more than a century, the American Red Cross has trained people how to respond during times of crisis. And with our CPR classes in Michigan, you can join us. Available online, in-person and via our blended Simulation Learning, which combines online coursework with an in-person skills session, you can learn how to help when it's needed most. 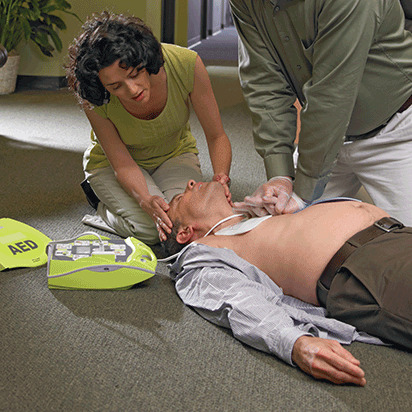 Stay abreast of the latest protocols for non-invasive treatments, like CPR (one- and two-rescuer), AED, ventilations (including BVM), choking (conscious and unconscious), and provide the care your patients need, when they need it. All of our Michigan CPR classes for healthcare providers are available in person and via our blended Simulation Learning, which gives you the flexibility to complete coursework online, then demonstrate your skills to a certified instructor. Both types of courses offer full certification that's valid for two years. In Michigan, CPR classes from the American Red Cross are available entirely online. Although it won't allow you to receive full, OSHA-compliant certification, these courses do give you a full understanding of how to respond to breathing emergencies and provide high-quality care during times of crisis. In order to help you make good decisions when providing assistance, our online classes include activities that can help you learn the proper protocols, even without attending a hands-on skills session. Although you may have recently taken one of our CPR classes in Michigan, if you don't use your skills, they can fade from memory. In order to help keep them fresh in your mind so that you can help those in need, we've created a simple step-by-step guide that you can print up and place on your refrigerator, in your car, in your bag or at your desk. After successfully completing your CPR training in Michigan your certification will be good for two years. In order to help you maintain your certification, we offer abbreviated CPR renewal classes not only allow you to stay up to date on the latest techniques, but once complete they allow you to extend your certification by two additional years. Keeping your students safe is everyone's job. That's why we offer CPR classes in Michigan that are designed specifically for schools. Our program allows educators, administrators and other staff members to become instructors who can then deliver training to students and faculty. This way, you can easily build a campus community that's prepared to help during times of need. At the American Red Cross we offer CPR classes and training in Michigan, but our expertise goes far beyond its borders. In fact, we operate in every state and are part of a humanitarian network that responds to emergencies and provides training in more than 180 countries worldwide. In addition, in order to ensure that our health and safety class materials are based on the latest and best in emergency science, our trainings are developed by experts in the field and reviewed by the Red Cross Scientific Advisory Council.